Advantage: simple, much safer than samba & nfs, support non-English when mounted in windows. For instance, OpenSSH-powershell for Windows. See here for detailed steps. OBS 2: pub key login seems NOT working ??? WARN: the whole C: disk will be shared as root. OBS 1: option allow_other will permit others non-root to read and write files as root. 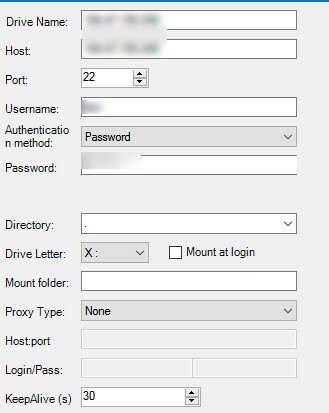 OBS 2: be careful of default_permissions option: this option make allow_other NOT useful, others non-root cannot access the folder. Tip 1: for permanent mount, see digitalocean. Tip 2: for error "Transport endpoint is not connected", run "umount -l /mnt/share", l means lazy clean. Run desktop shutcut, fill ssh server login info and "save", then "mount". Tip: Win-SSHFS will automatically ask for .net v4.6 if it is not yet installed. OBS: win7 has limitations, dokan requires KB3033929.